Jon Hamm looks good wearing a crumpled linen suit and aviator sunglasses, and this, perhaps, is all you need to know about The Negotiator, the new film from director Brad Anderson and producer/writer Tony Gilroy. 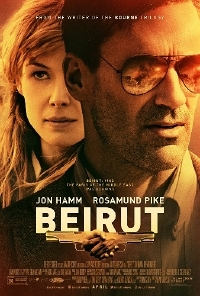 It’s a classy espionage thriller with lots of brooding and shouting, all set in and around war-torn, ‘80s-era Beirut. It passes the time. Agent Hamm is a hard-drinking burn-out whose career has gone, “from Kissinger to the crapper!” But he’s also an expert negotiator (apparently) so his team of secret service handlers, Rosamund Pike and Shea Whigham, must steer this boozy liability from underground meetings to tense trade-offs as he attempts to work out a deal and secure his friend’s release. I just sat there and let it roll over me, but there are some things to note I suppose. Rosamund Pike feels sadly wasted in a relatively thankless role, which really could have been played by anyone. Jon Hamm is almost distractingly handsome; I don’t know of any alcoholics who can maintain looks like his on a bottle of scotch a day. Also, apparently being a top-gun negotiator means being the only person in the room who has any common sense, but that’s the movies for you. This film is successful, in as much as it fulfils what it sets out to do, but it is nobody’s best work. Everyone involved here has and probably will go on to do better. But the pace is brisk, the tone is tense and serious, though there are occasional welcome moments of levity, as well as sudden bouts of violence. Something for everyone, as they say; or, “This year’s Argo” (for the DVD cover). Picture Jon Hamm in sunglasses, swigging from a hip-flask, shaking his head, and then looking serious, and you get the idea. It passes the time. And yes, I want to marry Jon Hamm.